I've been a bit slack on the posting front because I've been waiting to blog about my new boots and the new (finished! I knitted something for me!) cardigan. Yet the daft amounts of rain (no snow here) coupled with seasonal illness means we've not mustered enough energy to do a quick photoshoot. We're in the new bus and I've not even taken any photos to show you, should you need any further evidence to prove what a bad blogger I've been lately. Nonetheless, I have the urge to blog, so I thought I'd turn my attentions to something that's been on the blogging-to-do list for a rather long time: share more about the inspiration behind the Woolly Wormhead designs. The name, as mentioned before, is made up of two parts, just as the inspiration has two sources. So, let's start with the first half of the name, which corresponds with the 2nd half of the Hat. 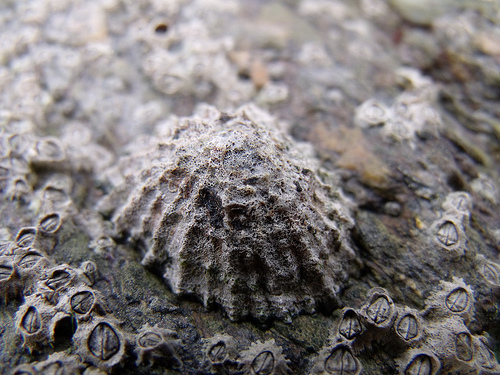 Limpets. Those weird and wonderful sea creatures that super-glue themselves to rocks all around the shoreline. Ever tried to shift one? We used to try as kids, and failed everytime. They were rock solid. I hope you can see from the photo above just how the crown shaping resembles the striking lines that adorn their conical shells. It's no secret that that I love the forms found on shells and sea creatures - their naturally occuring patterns and organic forms really inspire me; they're almost magical. Except I'm a far more logical person than magical, and it's the near perfect repetition of the patterns and forms that intrigue me. When working through the crown shaping for this Hat I felt it really important to not only fit the shaping into the pattern (as is my norm) but to also keep the lines as straight as possible. Balanced decreases are the secret here, and they work a treat. Except the balanced decreases alone don't finish a design, it's where they're placed that make all the difference. The latter half of the name corresponds to the first part of the design. You may think that the leaves are the key focal point, but not to me. Instead, the lines are. Petioles are those tiny little stalks at the base of a leaf that connect it to the branch or stem. They are the hidden support behind the leaf and have a very important role. With Limpetiole, lines of knit stitches come up from the brim into the body, and it's here where the petioles can be seen. They develop into the leaves, which then lead back into those lines of knit stitches, keeping continuity and subtly shifting the emphasis from the leaves. I do have to admit that I didn't intentionally sit down and combine these two elements together, it's not really how I work. My brain is constantly collecting visuals, and it stores them away in some remote corner. Then, at often the most random of times, it throws up an idea combining elements from seemingly unrelated times or places. I nearly always know where the influences have come from, hence I can explain the inspiration behind a design, so perhaps it isn't so much out of the blue as it may first appear. It's as if my brain is already programmed to combine common elements, as if it were finding common denominators.